Taking advantage of the ridiculous demand for housing, a JP player from Chocobo server has offered a small Shirogane plot he has acquired during the mad login rush to the public. ▼ When virtual plots are sold for real money. 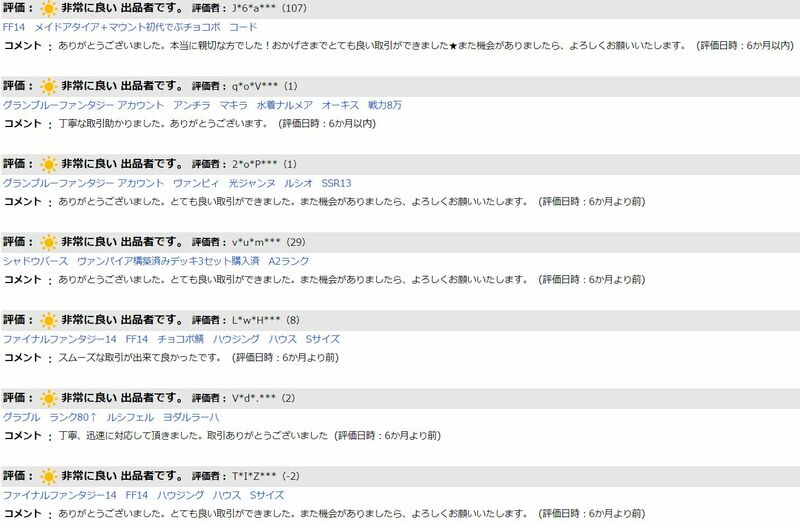 Posted on Yahoo Auctions, the player sought 60,000 yen ($US534) for the small plot, and it seems that the auction has ended just a few hours ago. Whether or not the transaction actually went through is up to speculation, but this just proves how bad the housing shortage is regardless of region. It isn't the first time this dude has done this though, because the merchant has a history of selling houses and 7-eleven collaboration item codes online. ▼ At least he's got good feedback for his illegal sales. It seems that he has also begun to sell Deltascape (Savage) runs for real money too. While I cannot give a specific date on when personal housing will be implemented, I can say that prices will be completely separate from free company housing, and, naturally, far more affordable. This falls under rmt, which will warrant a ban. I think selling for ingame currency can be overlooked, but for real money he should definitely be reported. If SE could ban him they should... but they don't even look at the people trying to scalp on reddit, I doubt they will look into this. What difference would banning make? He's clearly got the funds to just proxy up with a new account and do it all over again. Plus it's all happening off-site, as it were, so they're a bit limited in what they can pursue. But I thought JP servers didn't get bombarded with RMT chat spam because they're so high and mighty and would never participate in RMT. Gonna be honest. Slightly jealous I didn't get the idea and did what the JP guy did. Seems like a good amount of money to me.